This is a chance to own an insane off-roading toy. It's not very often that we see something as odd as a Local Motors Rally Fighter listed for sale. Typically, we only see amazing off-road machines like the Rally Fighter in movies or when we are playing Forza Horizon 3 and need a good rally vehicle. We love using the Rally Fighter in the game, but never gave much consideration to owning one. We wouldn't even know where to purchase one, until now that is. We found a 2014 Local Motors Rally Fighter listed on the DuPont Registry at Taggart Autosport in Cary, North Carolina. Local Motors has been gaining popularity as an automaker that builds cars using a 3D printer. The Rally Fighter was built to disrupt the auto industry and be completely unique. 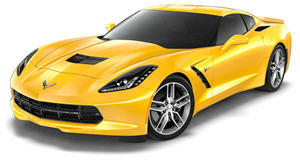 Power comes from an LS3 Corvette V8 engine with 450 hp. The engine has been supercharged, so it now produces 500 hp. The Rally Fighter has 20-inches of wheel travel, so there aren't too many locations this thing won't be able to get to. Just ask anyone who has driven it off a cliff in the Forza Horizon game. The LS3 sends power to the rear wheels through a GM 4L60E 4-speed automatic transmission and a Ford 9-inch rear-end with a 4.11 gear. 0-60 takes 6 seconds, which is impressive for such a big vehicle. Top speed is 131 mph. It may not look like it, but the Rally Fighter is completely street legal, although we bet it would be very odd to spot one in a grocery store parking lot. The photos show there is a trunk, but most of it is taken up by a spare wheel. Equally surprising is the presence of four seats. We expected the interior to be completely stripped out, but it seems pretty functional. We wouldn't dare call it luxurious, but there is a much-needed backup camera in the rear view mirror and what appears to be basic A/C controls and an infotainment screen. The price for all of this off-roading goodness is $108,900, which doesn't sound that bad given the price of expensive off-roading toys like a modded Defender or Wrangler.